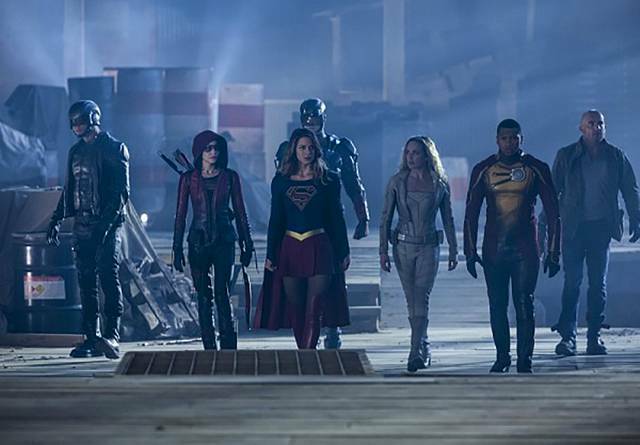 In what was one of the most hyped, eagerly-anticipated TV crossovers of all time, the combined shows of the FlArrowverse finally teamed up. The result was simple: as with DC’s movies, regardless of ratings or box office, critically it sucked. It’s the Thanksgiving special that we shouldn’t be thankful for. After so much hype for the crossover, fans were itching for it to get started and things looked to be going well when a breach opened up between two parallel worlds. Except nothing happened. Then nothing happened again when another breach appeared halfway through that episode. Instead, that episode of Supergirl focused on a bioweapon being used against the alien population of National City – a storyline which could just as easily have been used in a later episode. Unless they goofed in the final act of the crossover. What? The storyline they ran for the Supergirl episode involved a bioweapon targeting a certain section of the population. Thematically, that’s pretty close to what the Dominators’ plan was in the Invasion. The only thing which would have made this first episode important to the crossover in its current form was if, before the final fight, Supergirl realised that the Meta-Bomb’s virus was similar to the one from her world, and used that knowledge to help save the day. It would have made the most sense in finding a solution, and brought the plot full-circle. Except they didn’t do that. Maybe it was on the drawing board but never used, or maybe the writers didn’t even think of it, but either way it makes that Supergirl episode look completely pointless. What about The Flash though? Well, it’s a sad fact that the Flash installment of this huge crossover suffered from the same sort of weak, lazy writing which plagued the first two seasons of the show. Which is a shame, because season three has done so much to finally fix it. However, this second part of the Invasion had the alien Dominators land in Central City for no real reason and, before anyone can work out what’s happening, the Flash has put together his extended team of heroes to combat them. That sounds great in theory, except the line-up of DC’s assembled powerhouses looks a little… thin. 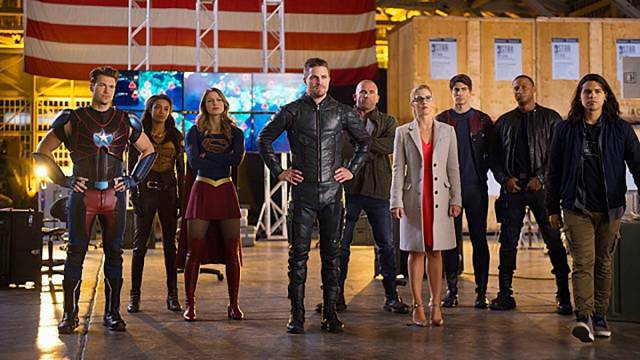 Sure, there’s Team Arrow, which means Ollie, Diggle, Speedy and the gang are included. None of whom have any real powers, but they can all hold their own. Then there’s Supergirl, a smart choice, but no J’onn or Mon-El even though the fate of an entire planet is riding on this. And, of course, there are the so-called Legends. Except for Steel and Vixen, who have superpowers but stay aboard the Waverider for no real reason. But that’s okay, because there’s still the Atom, Firestorm, White Canary and Heatwave – a team so astonishingly lame that in previous adventures they haven’t even been able to beat average gun-toting henchmen in combat, despite having some neat gadgets and skills on their side. However, it’s good they’ve all come together since the President of the USA has been targeted by the aliens! Although wouldn’t it have made more sense to bring in some MORE heroes with powers? Like, say, the Flash “Family” or the Hawks? Where was Wally? He’s a speedster now, so surely the debate between him and Joe should have taken a backseat during such a huge emergency? Or how about Jay Garrick and Jesse Quick? Since Supergirl was only a little world-hop away and it was fine to get her, then why not call in these other heroes to help? Then again, given how more concern was focused on everyone’s petty disputes between Barry and his team (which had them split up, naturally) over the safety of the President and the whole planet, there was no impact to the Invasion anyway so they didn’t need to bother. Although if you were about to fight a war, wouldn’t you want every superpowered soldier you could find? Sure you would. Add to that how their “training” to combat aliens involved them all simply charging in a straight line – with no actual battle plan – towards a hovering Supergirl (because, like, she’s an alien so she’s the same as the Dominators. Although they can’t fly, nor do they have any of her abilities), more hypocritical lectures from White Canary about how Barry has no right to change the timeline, and the glossing over of the death of Captain Cold and it’s one of the dumbest crossover instalments ever. At least, it was one of the dumbest installments until this episode beat it. In a series which has become notorious for its flashbacks, it made a welcome break to get away from them. Unfortunately, the alternative offered was a series of What If? dream sequences, where Ollie and friends are living their lives in a mass hallucination. Since every viewer knows instantly that it’s all a fake, it really didn’t amount to anything more that wasting screen time. The stakes have never been lower as Ollie and the other captured heroes have to escape from this false reality which glitched more times than the Superman 64 computer game. A large portion of this episode dealt with this dream sequence, making it incredibly disappointing to have what could have been a pivotal part of the Invasion story interrupted for nothing but fluff. On the plus side, the rest of Team Arrow regrouped in the ArrowCave with Cisco Ramon to find a way to save our lost non-Meta heroes. Yet… where were the Metahuman heroes? You’d imagine that they’d all be regrouping together with Team Arrow so that they could come up with a plan, but instead they’re magically missing. Until, of course, Felicity Smoak calls in the Flash and Supergirl to fight… someone who has nothing to do with the Dominators, in another waste of time. Where were Firestorm and Heatwave throughout all of this? Why hadn’t Steel and Vixen arrived as reinforcements? Why hadn’t anybody called in Jay, Wally and Jesse as backup yet? For that matter, what’s the plan of the Dominators? Yes, three episodes into a four-episode crossover and the alien villains of the piece still hadn’t been given any motivation for their actions at all. To say they were one-dimensional is putting it mildly. But who needs a reason for a crossover when there’s the melodrama of Ollie wanting to elope with a fiance who he knows isn’t even real? Oh, and just for the sake of it, Ollie and his friends escape from the horrific torture of, um, dreaming of a happy life. It seems they’re being held in an unguarded room on a spaceship, and manage to get away safely despite being chased by hundreds of well-armed ships, and… need we say more? The Dominators have all the aim of Stormtroopers and the intelligence of Doctor Evil. Since the President has been killed (which nobody seems concerned about) and the world is on the brink of intergalactic war (which the military don’t seem bothered by), it’s sad that this whole Invasion plot depended on the weakest of all the shows to resolve this unfocused story. With all the heroes back in the same room again, they figure that it makes sense to split up. Arrow tells Supergirl to take a hike for no logical reason before he, Flash, Atom and White Canary meet the new President. Which, of course, is a trap. Meanwhile, far more importantly than the fate of the planet, Professor Stein is trying to resolve his alternate timeline issues with the daughter he didn’t have before. As for the rest of the so-called Legends, they’ve traveled back to 1951 to kidnap a Dominator, which gets them in some trouble with the local Men In Black. Finally, the motivation for the Dominators is revealed: fearing the growing numbers of Metahumans and the impact it may have on their planet in the future, the Dominators want all Metahumans dead. Or something. Honestly, it’s kind of hard to tell because they also seem to blame Barry Allen for screwing around with the timeline for some reason which isn’t explained properly. Although, like with Citizen Steel, it’s never really been explained how people can tell that the timelines have been changed. But Barry screwed with time, and so it’s all about him getting a spanking. So the Dominators don’t really hate all Metahumans (even though they fear what might happen to their own world in the future), just Barry. Yet they’re more than willing to target all Metahumans with the Meta-Bomb just to get him, even though they could simply use a teleporter from orbit to beam him away at any point, without ever alerting anyone. The important thing here is that the heroes get to fight and that the good guys win. They do this by… charging in a straight line at their enemies. Gee, it looks like all that training paid off. Also, the Flash and Supergirl fly around attaching torture devices to all the Dominators all over Central City, the USA and presumably the whole planet – a job which would have been a whole lot easier with the help of a few more speedsters and the coordinates of every single Dominator. As for the Meta-Bomb, it’s transmuted into water thanks to Firestorm, something he strangely didn’t think of doing when there was a nuclear bomb in New York just a few episodes ago. To wrap it all up, this story (and the Legends episode) ends with not one but two scenes of Barry and Ollie congratulating themselves over how amazing they are. So much for the Legends. They don’t even get to round out their own show. There’s a level of DC arrogance here which is astonishing, and it’s clear who they’re aiming it at. If you said Marvel, then you’d be right! Supergirl even calls this assembled unit of non-trinity characters “Earth’s mightiest heroes”, a term used often to describe Marvel’s Avengers. But what is it which makes this boast seem particularly ridiculous? It’s certainly one of the most ambitious TV projects out there to have a crossover of this size – and well before Marvel Netflix’s upcoming Defenders series. It’s also fair to compare the end of the Invasion storyline to the Avengers film’s Battle Of New York. Except that isn’t really a good thing. The aliens in the Avengers film were, as even the biggest Marvel fans will admit, lousy. They were faceless, nameless, pointless cannon fodder who were only there for the Avengers to smash their way through before striking a pose. By comparison, the Dominators in the comic books were intelligent and sneaky, and it’s a shame to see them done so little justice here. Being hampered by a TV budget, these shows could never pull off the visuals of Avengers and it shows. Strangely, the final fight on a Central City rooftop starts out like the airport battle in Captain America – Civil War. Which would have been good if these shows had the budget and the time to really deliver a massive fight scene, but they didn’t. Ironically, they could have had more time if they’d done the Supergirl and Arrow shows properly, but chose not to. The Atom could have gone giant again, Supergirl could have bobbed and weaved in and out of the scene, Mister Terrific could have finally had time to shine and Vixen could have charged through the Dominators like the elephant we see her “summon”. Instead, the characters did a bare minimum as they resort to basic fisicuffs, and none of them look impressive. It’s fine for DC to boast about the achievement they believe they’d pulled off with this crossover, but to do it so clumsily and with so little justification makes Invasion look like it’s all tell and no show. If you’re going to make statements that this is the best team-up ever or that your characters are Earth’s mightiest heroes, you have to earn it. Totally agree here. Thought it would be cool, but in the end, dissapointing in a big way. I did have a moment of glee when they showed the Star Labs back warehouse is no big deal except it’s the FREAKING HALL OF JUSTICE!!! Total squee moment there. Firestorm he can transmute stuff? Since when? TV just totally glossed over this like it’s no big deal. In the comics he can stop Superman with those powers plus phase in and out of solid material. Transmutation is his real character defining powers and the show just has him flying around on fire and junk. Fail. What about the times when Marvel has taken potshots at BvS in its comics? For DC, it’s arrogance. For Marvel, it’s humour. Please collect your Marvel fanboy credentials and do not pass left. I enjoyed it. Sure it was a bit campy but it was fun. Starting to think you new age fanboys are spoilt rotten. @Darin Carlson Firestorm used his transmutation powers a couple of times in Season 1 Legends of Tomorrow. First to transmute a rifle into… dust or something… when fighting Nazis and secondly to transform Savage’s meteorite. He really doesn’t trot out this ability as often as he should given its usefulness but it’s been well-established in canon. The big problem with the Arrow episode is that it was the 100th episode of Arrow and it was more interested in being an anniversary episode (hence the “It’s a Wonderful Life” theme) than in being part of the crossover. It would’ve been a perfectly good anniversary episode of Arrow – had it not taken place in an alien invasion crossover!